India has a legacy of three distinct ancient Jewish groups: the Bene Israel, the Cochin Jews, also called the Malabar Jews, and the White Jews from Europe. Each group practiced important elements of Judaism and had active synagogues. The Sephardic rites predominate among Indian Jews. More recent Jewish immigration to India includes the Baghdadi Jews, Bene Menashe, and Bene Ephraim. Jewish merchants from Europe traveled to India in the medieval period for purposes of trade, but it is not clear whether they formed permanent settlements in south Asia. Our first reliable evidence of Jews living in India comes from the early 11th century. It is certain that the first Jewish settlements were centered along the western coast. Abraham ibn Daud’s 12th century reference to Jews of India is unfortunately vague and we do not have further references to Indian Jews until several centuries later. Migrations in the 16th and 17th centuries created important settlements of Jews from Persia, Afghanistanand Characin (Central Asia) in northern India and Kashmir. By the late 18th century, Bombay became the largest Jewish community in India. 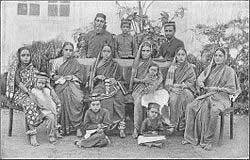 Bene Israel Jews lived in Bombay, as did Iraqi and Persian Jews. The Bene Israel (“Sons of Israel”) lived primarily in the cities of Bombay (now Mumbai), Pune, Karachi (now in Pakistan), and Ahmadabad. The native language of the Bene Israel was Judeo-Marathi. They arrived in India nearly 2,100 years ago after a shipwreck stranded seven Jewish families from Judea at Navagaon near Alibag, just south of Mumbai. The Bene Israel claim to be descended from Jews who escaped persecution in the Galilee in the 2nd century B.C.E. The Bene Israel resembled the non-Jewish Maratha people in appearance and customs, which indicates intermarriage between Jews and Indians. The Bene Israel, however, maintained the practices of Jewish dietary laws, circumcision, and observation of Sabbath as a day of rest. The Bene Israel say their ancestors were oil pressers in the Galilee and earned the nickname “Saturday oil-pressers” because they abstained from work on Saturday, which is the Jewish Shabbat, a day of rest. In the 18th century, they were “discovered” by traders from Baghdad. At that time, the Bene Israel were practicing just a few outward forms of Judaism (which is how they were recognized), but had no scholars of their own. Teachers from Baghdad and Cochin taught them mainstream Judaism in the 18th and 19th centuries. In 1796 “Shaar Rahamim”, the first Bene Israel synagogue, was built in the city. After its establishment, several other synaogues and Jewish centers emerged throughout Bombay. David Sassoon and his followers fled to Bombay in 1832 following the pogroms of Daud Pasha in Baghdad. The Sassoon family became known as the “Rothschilds of the East” because of the wealth they accumulated in trade and also because of their philanthropic donations to the community. In fact, many well-known landmarks in Mumbai today can be attributed to the Sassoon family. In the 1830s, there was an estimated 6,000 Bene Israeli Jews living in India, and nearly 10,000 at the turn of the century. At their peak in 1948, the Bene Israel numbered 20,000. Since then, most of the Bene IsraelJews have migrated to Israel, and under 5,000 remain today. The Bene Israel community claimed to be descendents of theKohanim, the ancient Israelite priests, which claims descent fromAaron, the brother of Moses. In 2002, a DNA test confimed that the Bene Israel share the same heredity as the Kohanim. The first Jews to come to India were the Jews in Cochin in southern India (today, its the port city of Kochi) were the so-called “Black Jews,” who traditionally spoke the Judeo-Malayalam tongue, native to the state of Kerala. Some say that these “Black Jews” settled in the Malabar coast during the times of King Solomon of Israel, and after the Kingdom of Israel split into two. The Pardesi Jews, also called the “White Jews” settled later, coming to India from western European nations such asHolland and Spain, and spoke the ancient Sephardic language of Ladino. A notable settlement of Spanish and Portuguese Jews starting in the 15th century was Goa, but this settlement eventually disappeared. In the 17th and 18th centuries, Cochin had an influx of Jewish settlers from the Middle East, North Africa, and Spain. The Jews of Cochin traditionally say that they came to Cranganore (an ancient port near Cochin in south-west India) after the destruction of the Temple in 70 C.E. They had, in effect, their own principality for many centuries until a chieftainship dispute broke out between two brothers in the 15th century. The dispute led neighboring princes to dispossess them. In 1524, the Moors, backed by the ruler of Calicut (today called Kozhikode) attacked the Jews of Cranganore on the pretext that they were tampering with the pepper trade. Most Jews fled to Cochin and went under the protection of the Hindu Raja there. He granted them a site for their own town that later acquired the name “Jew Town” (by which it is still known). Unfortunately for the Jews of Cochin, the Portuguese occupied Cochin in this same period and indulged in persecution of the Jews until the Dutch displaced them in 1660. The Dutch Protestants were tolerant, and the Jews prospered. In 1795, Cochin passed into the British sphere of influence. In the 19th century, Cochin Jews lived in the towns of Cochin, Ernakulam, Aluva, and North Paravur. 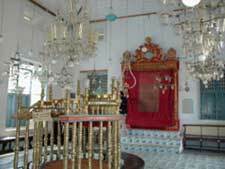 Most of Cochin’s Jews have emigrated (principally to Israel), intermarried, or converted, and now there are believed to be only 13 elderly Indian-born Jews, from seven families, still living in Kochi. 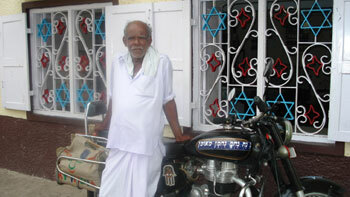 There are currently 53 practicing Cochin Jews in Kerala, along with three synagogues. 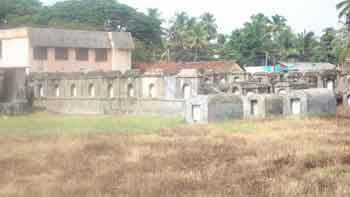 The Pardesi Synagogue in Kochi, built in 1568, is the only one still open and is a protected heritage site. Many fear that the Jews of Cochin will soon wither away. Jew Town Road, Cochin across from Pardesi Synagogue. Notice the Rabbi Nachman stickers on the motorbike. Near the end of the 18th century, a third group of Indian Jews appeared. They are the middle-eastern Jews who came to India through trade. They established a trading network stretching from Aleppo to Baghdad to Basra to Surat/Bombay to Calcutta to Rangoon to Singapore to Hong Kong and eventually as far as Kobe, Japan. There were strong family bonds amongst the traders in all these places. Typical is the founder of the Calcutta community, Shalom Aharon Ovadiah HaCohen. He was born in Aleppo in 1762 and left in 1789. He arrived in Surat in 1792 and established himself there. He traded as far as Zanzibar. In 1798 he moved to Calcutta. In 1805 he was joined by his nephew, Moses Simon Duek HaCohen, who married his eldest daughter Lunah. Soon the community was swelled by other traders and Baghdadis outnumbered those from Aleppo. Under British rule, the Jews of India achieved their maximum population and wealth, and the Calcutta community continued to grow and prosper and trade amongst all the cities of the Far East and to the rest of the world. 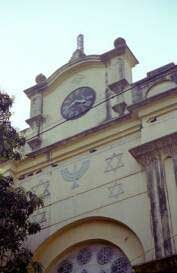 The Indians were very tolerant and the Jews of Calcutta felt completely at home. Their numbers reached a peak of about 5,000 during World War II when they were swelled by refugees fleeing the Japanese advance into Burma. The first generations of Calcutta Jews spoke Judeo-Arabic at home, but by the 1890s English was the language of choice. After WWII, the rise of Indian nationalism made Jews feel less comfortable because they were identified with the English by the Indians. India’s Jewish population declined dramatically starting in the 1940s with heavy immigration toIsrael, England and the United States. This is where most Indian Jews live today. The Jews of Calcutta now number about 2,150, of whom 150 are European and the remainder natives of Asiatic Turkey, Persia, and southern Arabia. The Baghdadi Jewish community, so-called because they are descents of Iraqi Jewish immigrants who came to that country during the British Raj, not only includes Jews from the Iraqi capital city of Baghdad, but from other areas of Iraq, as well as Jews from Syrian, Yemenite, Persian, and Turkish origin. The community developed as a result of Jews fleeing religious persecution in Muslim lands to the northwest of India during the British imperial era. Unlike other Jewish communities in India whose oral tradition attest to a presence in India going back as long as 2000 years, the Baghdadi communities were established relatively recently (in the past few centuries). The Baghdadis have completely assimilated into Indian society. A contributing factor for their assimilation was their physical features and resemblance to the East Indians. The Baghdadis originally came to India from Iraq, Turkey, Syria, Iran, and Afghanistan, so they had dark olive skin and black, dark brown hair, that gave them that distinct Middle Eastern appearance and an Indian resemblance. The Bene Menashe community consists of approximately 7,000 members of the Chin-Kuki-Mizo tribe, which lives in the northeast Indian states of Manipur and Mizoram, near the border of Myanmar. Linguistically, they are Tibeto-Burmans. For generations they kept Jewish traditions, claiming to be descended from the Tribe of Manasseh, one of the Ten Lost Tribes of Israel that were exiled by theAssyrians in the eighth century B.C.E. and have since disappeared. In the 19th century, the tribe’s members were converted to Christianity, but in the 1970’s, some of the community began practicing Judaism again and set themselves apart from the rest of the tribe, after Pentecostalist called Chalianthanga or Mela Chala (the name varies) from the Buallawn village dreamt that God instructed him to direct his people to return to their pre-Christian religion, which he determined to be Judaism, and to return to their original homeland, Israel. The group was named Bene Menashe by Rabbi Eliyahu Avichail, who heard about the tribe in 1979 and traveled to their village in India several times in the 1980s, because they believe that the legendary Kuki-Mizo ancestor Manmasi is one and the same with Menassah, son of Joseph. Rabbi Avichail’s organization, called Amishav (Hebrew for “my people return”) dedicated himself to converting the Bene Menashe in the Orthodox tradition, and eventually bring them to settle in Israel. In July 2005, the Bene Menashe community built their first mikvah, or a Jewish ritual bath, in Mizoram under the supervision of Israeli rabbis in order to begin the conversion process. Shortly after, a similar mikvah was built in Manipur. In mid-2005, with the help of Shavei Israel, an organization founded by Avichail’s friend, journalist Michael Fruend, and the local council of Kiryat Arba, the Bene Menashe opened its first community center in Israel. In March 2005, Chief Rabbi Shlomo Amar, one of Israel’s two chief rabbis, decided to recognize the members of India’s Bene Menashe community as descendants of the ancient Israelites due to their exceptional devotion to Judaism. Nevertheless, those who arrived in Israel were required to go through a conversion process. Indian religious figures in the Mizo-Kuki churches in Mizoram, as well as Indian government officials, later expressed concern about the plan to convert the Bene Menashe and bring them to Israel so the effort was suspended, although members of Bene Menashe continued to arrive in Israel in 2006 and 2007. After a five-year period when there was no aliyah, the Israeli government announced in November 2012 that it would resume flights to bring the Bene Menashe to Israel, starting with a planeload of 270 people. Since the early 1990’s, approximately 3,000 Bene Menashe have immigrated to Israel; another 5,000 are in the pipeline waiting to immigrate. In October 2013, the Israeli government gave approval for 899 more Bene Menashe to come. Seventy-eight Bene Menashe Jews landed in Israel in June 2015, bringing the total number of Bene Menashe immigrants to 3,000. This group will be the first Bene Menashe Jews to settle in the Golan Heights. The Bene Ephraim (in Hebrew, “Sons of Ephraim“) are a small group of Jews, sometimes called the Telugu Jews because they speak Telugu, a Dravidian national language of India, who reside in the south-eastern province of Andhra Pradesh, whose recorded observance of Judaism, like that of the Bene Menashe, is quite recent, going back only to 1981. In the 19th century, the Bene Ephraim were converted to Christianity by Baptist missionaries. Since 1981, about fifty families around Kottareddipalem and Ongole (capital of the nearby district of Prakasham) have begun to study and teach Torah, learn Hebrew, and sought recognition from other Jewish communities around the world. The community has been visited over the years by several groups of rabbis, who have thus far not seen fit to extend the same recognition to this community as that recently extended to the Bene Menashe. In 1992, the first Bene Ephraim synagogue opened in Kottareddipalem, called The House of the Children of Yakob, founded by former Christian preacher Shmuel Yakobi, who first encountered Judaism in the 1980’s on a trip to Jerusalem. Yakobi also founded an independent open university offering correspondence courses in Torah and Hebraic Studies, calling the community the Council of Eastern Jewry. This entry was posted in Indian Jews, Jews of colour by jewsofcolourCAN. Bookmark the permalink.